Additional corner strength is something we offer if your PVC Banner is going to be in a particularly harsh / windy environment or if you wish to re-use your banner many times. 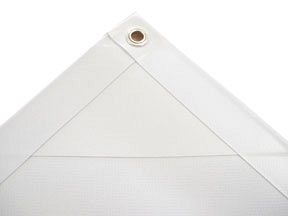 Generally with long term banners, the first point of failure is the corner eyelets, the added corner strength helps to prolong the life of your PVC Banner. Additional banner corner strength can't be seen from the printed side, it is all mounted on the rear side (unprinted side) of the banner. Cost is per banner, so £8 gets you 4 strengthened corners. If your banner is short life or used indoors we suggest not. The choice is really yours, but we do recommend it for longer outdoor life expectancy.